The concentration of pasteurized buffalo skim milk (PBSM) employing ultrafiltration (UF) alters the chemical composition of ultrafiltered retentate that adversely affect its proteins and salts equilibrium. Effect of stabilizing salts addition in concentrated milks or retentates was majorly dedicated to their thermal stability only. Therefore, this study was aimed to investigate the effect of disodium phosphate (DSP) addition and homogenization of 2.40 × UF retentate (0.60 protein to total solids ratio) on its ζ-potential, particle size, heat stability, turbidity, pH, viscosity and crossover temperature of storage (G′) and loss (G″) modulus. Concentration of PBSM in UF process, significantly (P < 0.05) increased its percent TS, protein, fat and ash contents, but markedly decreased its lactose content. DSP addition significantly increased (P < 0.05) the ζ-potential, pH, viscosity and particle size in majority of the homogenized and non-homogenized retentates. Homogenized retentates containing 2.5 and 5% DSP exhibited Newtonian and Power law flow behaviour. However, rheological behaviour of non-homogenized retentates containing zero (control), 1 and 4% DSP was best explained by Bingham model. Further, non-homogenized retentates with 0.5, 2, 3, 5% DSP exhibited Newtonian flow, but retentates containing 6 and 7% DSP was best explained by Power law. The correlation among different attributes of DSP added non-homogenized and homogenized samples were also studied. Particle size and turbidity (r = + 0.999, P < 0.05) as well as ζ-potential and crossover temperature of G′ and G″ (r = + 0.999, P < 0.05) showed positive correlation in 4% DSP added non-homogenized retentate. 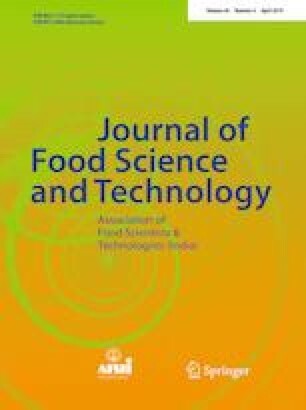 The first author is very grateful to the Director, ICAR-National Dairy Research Institute, Karnal for providing the required facilities to carrying out this work.